Turkey remains one of Europe's most popular Villa rental destrinations. Cheap villas in Turkey are a mix of sun, sea, mountains, and lakes that offers the holiday visitor from the UK a complete change from everyday life. From April to October, Turkey has an ideal climate that is perfect for relaxing on sandy beaches or enjoying the many sites. 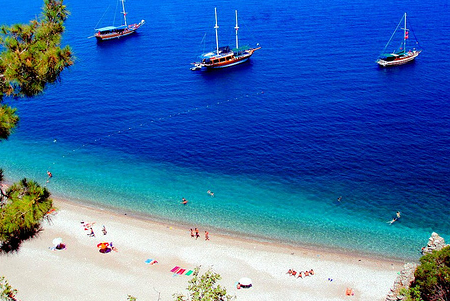 Turkey is friendly, largely unspoilt, beautiful, culturally rich and relatively cheap. Turkey is now a major holiday destination in Europe with the rapid development of both summer holiday and winter holiday resorts. Turkey is modern enough to be comfortable yet traditional enough to be interesting. Turks claim to be able to detect someone’s political affiliations from the shape of their moustache. The main resorts for holiday villas in Turkey are; Villas in Altinkum, Villas in Bodrum, Villas in Gumbet, Villas in Calis, Villas in Dalyan, Villas in Hisaronu, Villas in Icmeler, Villas in Kalkan, Villas in Kas, Villas in Kumlubuk, Villas in Marmaris, Villas in Olu Deniz, Villas in Ovacik, Villas in Side, Villas in Turunc.